According to Fox News Latino, the IMSS has suspended the vaccines pending the outcome of an investigation into why so many children have been killed and hospitalized. According to the entire mainstream media in the United States — which is 100% controlled by corporate interests — vaccines never harm anyone and are perfectly safe to inject into children in unlimited quantities. This dangerous, inhumane “Vaccine Injury Denialism” is rampant across the corporate-controlled media, which contributes to the deaths of innocent babies and children by refusing to acknowledge the truth that vaccines kill and injure children on a regular basis. 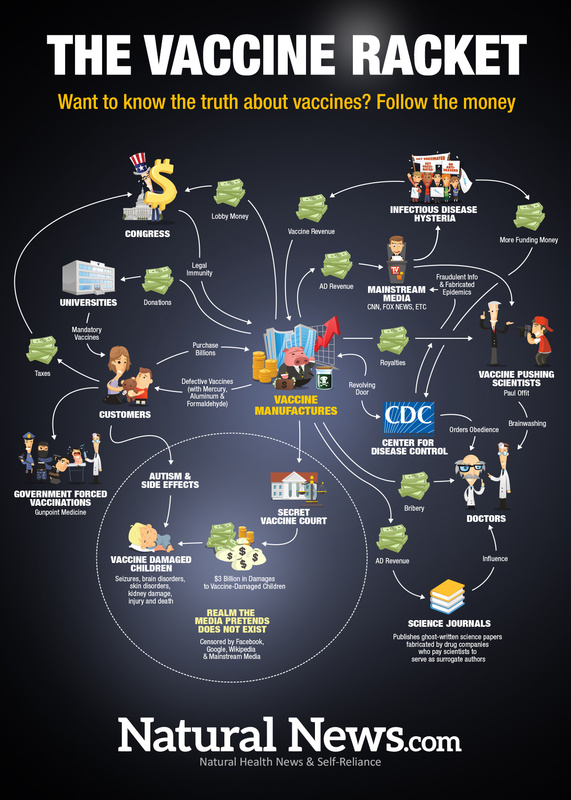 Just recently, in fact, the UK government agreed to pay $90 million to victims of the swine flu vaccine. That vaccine caused permanent brain damage to over 800 children across Europe. The truth is that vaccines regularly harm and even kill innocent children, most likely because of the toxic chemical adjuvants and preservatives they still contain. As the CDC openly admits, vaccines are still intentionally formulated with mercury, aluminum, MSG and formaldehyde. Some vaccines even use ingredients derived from aborted human fetal tissue. Last year, a CDC scientist blew the whistle on the CDC committing scientific fraud to cover up links between vaccines and autism in young African-American males. Test run for depopulation via vaccines? Tetanus vaccines given to millions of young women in Kenya have been confirmed by laboratories to contain a sterilization chemical that causes miscarriages, reports the Kenya Catholic Doctors Association, a pro-vaccine organization. A whopping 2.3 million young girls and women are in the process of being given the vaccine, pushed by UNICEF and the World Health Organization. Method #2 now appears to be under way in Mexico as 75% of those children injected with vaccines are now either dead or hospitalized. 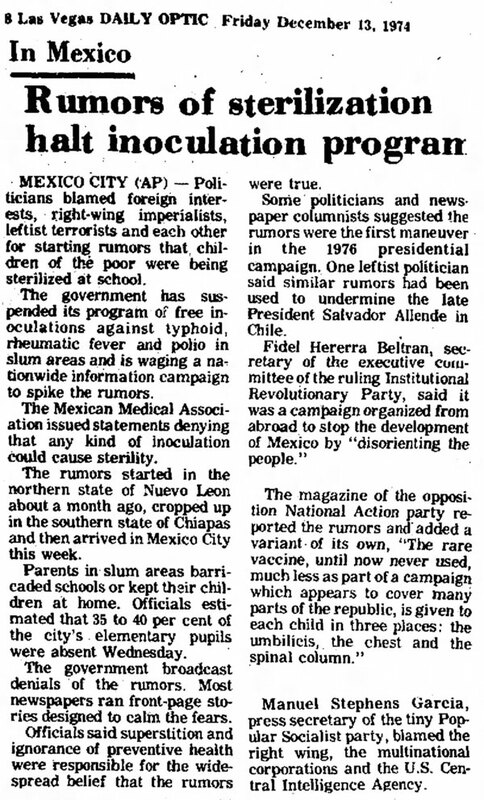 As Truth Stream Media exhaustively documented, a depopulation exercise was run in Mexico in 1974, using vaccines as the cover story. The scheme was dreamed up after the release of the National Security Study Memorandum 200 which highlighted the global population problem and urged governments to find ways to reduce the global population. Mexico City – Associated Press – Rumors that persons disguised as inoculation teams were giving school children shots that sterilized them forced health authorities to suspend all vaccination drives today and to post police outside Mexico City schools. Thousands of parents stormed various schools in the Mexico City area Tuesday and took their children home. 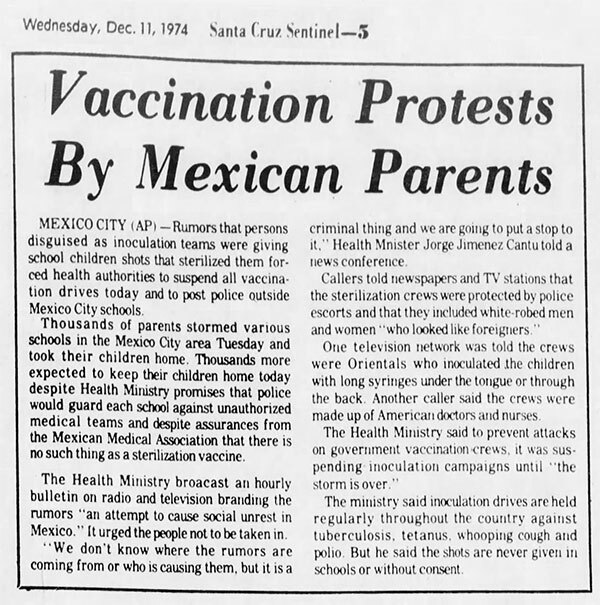 This same scenario is now about to be replicated in California, by the way, where SB 277 would criminalize parents of children who are not vaccinated, essentially at gunpoint. The Mexican Medical Association issued statements denying that any kind of inoculation could cause sterility… Officials said superstition and ignorance of preventive health [i.e. “anti-science”] were responsible for the widespread belief that the rumors were true. Very little has changed in four decades, it seems: the same tactic is still used today, even while children are being killed or injured every single day due to the toxic ingredients used in vaccines. The “science bullying” behind vaccines also allows governments of the world to run sterilization and depopulation programs disguised as public health. Once the population is bullied into accepting vaccines without question — blind obedience is now demanded almost everywhere — governments can add any chemicals they want to those vaccines, including chemicals that cause permanent sterilization or even death. The fact that all vaccine injuries are systematically denied to exist also means that any person harmed or killed by vaccines is immediately wiped from the national memory. 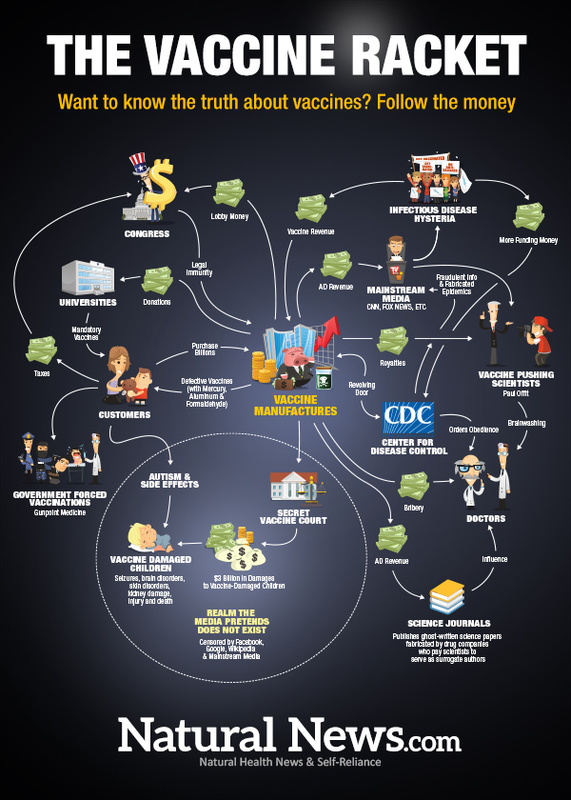 Like a criminal mafia, the vaccine industry works hard to hide the bodies and thereby maintain its monopolistic racket on the utterly false premise that vaccines are 100% safe. To further drive home this extraordinary medical propaganda, the CDC uses intelligence operatives like Nurse Hickox who spread disinfo through the mainstream media, which is always happy to comply with the destructive agendas of the vaccine industry. Nurse Kaci Hickox, who has made headlines over the last few days by refusing to quarantine herself after returning from the Ebola front lines in Africa, turns out to have been trained as an “intelligence officer” under a two-year CDC program modeled after the U.S. military. That same year, the CDC graduated 81 such “intelligence officers” whose names and photos are also listed in the public document. What’s the takeaway realization from all this? Vaccines have been and will continue to be used as a cover for forced depopulation programs involving sterilization or euthanasia chemicals. Obedience to vaccines allows depopulation teams accompanied by armed police to intimidate people into accepting any liquid they want to put in a syringe. That liquid might be a vaccine, or it might be a sterilization chemical or even a euthanasia chemical. After all, why go through the trouble of building gas chambers and rounding people up for mass extermination when you can achieve the same result without any resistance at all if you simply label the chemicals “vaccines”?